Manolo Gabbiadini scores a penalty against Newcastle. 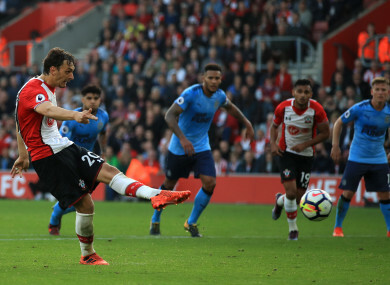 A BRACE FROM Manolo Gabbiadini on his first start in over a month prevented Southampton from suffering a third straight defeat in the Premier League, as the Saints earned a point with a 2-2 draw against Newcastle United on Sunday. Saints boss Mauricio Pellegrino will hope Gabbiadini’s double prompts a return to the sort of form that saw the Italian score six goals in his first four games for Southampton last season. Pellegrino played under Magpies boss Rafael Benitez at both Valencia and Liverpool, before later joining the Spaniard’s coaching staff at Anfield. There was nothing to separate the old friends in a hard-fought clash, with the first goal coming in the 20th minute. Christian Atsu’s driven effort was blocked by Maya Yoshida, but with Fraser Forster already diving to his left, Hayden’s first-time shot wrong-footed the goalkeeper. Gabbiadini whipped the equaliser through the legs of Javier Manquillo and into the bottom corner in the 49th minute. Perez restored the Magpies’ lead two minutes later, reacting fastest to Forster saving his initial shot by squeezing in the rebound from the angle. With 15 minutes left, Newcastle’s Florian Lejeune needlessly fouled Shane Long and Gabbiadini drilled the spot-kick past Rob Elliot to draw the scores level for a second time and earn his side a point. Email “Gabbiadini brace earns Southampton a share of the spoils at St Marys'”. Feedback on “Gabbiadini brace earns Southampton a share of the spoils at St Marys'”.